As for this cake, it is really good – my sister loved it – but hasn’t dethroned my favorite banana cake. I found the walnuts a bit bitter after being toasted twice – I’m using sliced almonds next time I make this recipe. Position a rack in the middle of the oven and preheat to 180°C/350°F. Butter a 23cm (9in) round cake pan. Measure the walnuts onto a baking sheet and toast in the oven until light golden-brown and fragrant, about 15 minutes. Set aside to cool completely. Sift the dry ingredients into a large bowl, pouring back into the bowl any bits of grain or other ingredient that may remain in the sifter. Set aside. Grind 1 cup of the toasted walnuts in a food processor, about 15 seconds. With a sharp knife, finely chop the remaining cup of walnuts and reserve – the chopped nuts will be added later as a topping. Add the butter and sugars to the bowl of an electric mixer with the paddle attachment. Mix on medium-high speed until light and creamy, about 3 minutes. Using a spatula, scrape down the sides of the bowl. Add the bananas and mix on medium for 30 seconds or until the bananas are broken down. Add the eggs, one at a time, mixing on medium speed until thoroughly combined. Add the sour cream and vanilla and mix until combined. Again, scrape the sides of the bowl. Add the ground walnuts and the dry ingredients and mix on low speed just until combined; remove the bowl from the mixer and finish mixing using a spatula, until smooth. Scrape the batter into the prepared pan and smooth the top. 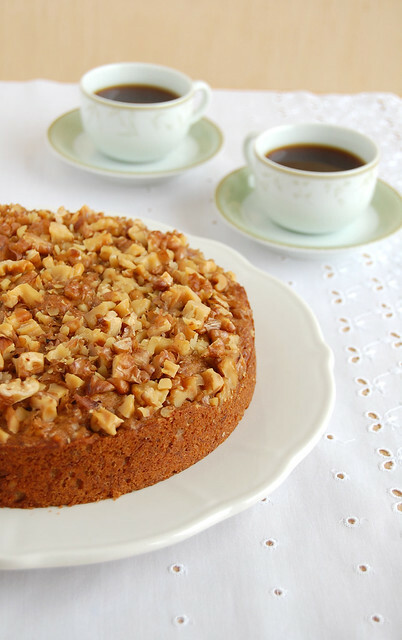 Sprinkle with the reserved walnuts and bake for 50-60 minutes or until the cake is golden brown and a skewer inserted in the center comes out clean. Cool in the pan. Wrapped in plastic, the cake can be kept for up to 3 days. how would you compare it to a regular APF cake? I am planning to switch my diet to a gluten free, and i know quinoa flour is GF. the cake looks amazing ! Do you know if you can make quinoa flour by grinding up quinoa like you can with oats/oat flour? I'd like to try it but I don't really have room for too many specialty flours in my kitchen. I love baking with Quinoa flour! This looks absolutely delicious, Patricia! And I don't even like bananas! I've got a bunch of special flours in my pantry now. Just tried out 2 varieties. I can't wait to see your other bakes. Have tried making your fav banana cake. This one sounds really good. Will try to get quinoa flour first. I have yet to try quinoa flour. But this cake looks amazing and Ican't wait to see what other flours you willbe baking with! Awesome and beautiful looking cake..
Wow, this sounds SO incredible! And it looks so comforting and delicious too. Love the blog! Especially the Cinnamon Candy Canes you posted last December. Yummmm! Ah, I was drooling over this book the other week at the store. So gorgeous... This cake sounds quite delish. Can never have enough tasty cake recipes :). pretty looking cake, hope to have a slice now. Lovely cake P! Happy to see you're having fun with quinoa - I love adding healthy whole grains/seeds into my goods. I love the use of quinoa flour here and ALL the walnut goodness! yum! looking at the ingredients, i know i would LOVE this cake. good on u for trying different flours. ive yet to use quinoa flour yet...def healthier...and i love how you used yoghurt instead of the sour cream! Susan, thank you, my dear! I cannot wait to bake with quinoa again! Zoe, did you like the other cake? Naomi, I hope you like it! Thank you! Cherine, tks for stopping by! Katie, yum, pecans! Great idea, sweetie! Indie.Tea, tks for stopping by! Xiaolu, it is full of breathtaking photos! I'm glad you like the cake, sweetie! Jess, I wish I could share it with you! Patty, thank you, lovely! I'll be adding the nuts raw next time - great idea! Vivienne, tks for stopping by! Sour cream is impossible to find here in Brazil, so yogurt is always my choice!